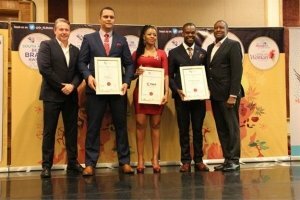 On Thursday, 4th April 2019 CMO Asia recognised and honoured South Africa’s Best Brands at the Hilton Hotel in Sandton, Johannesburg. Posterscope South Africa walked away with the prestigious South Africa Best Brand Award which was endorsed by CMO Asia. CMO Asia is an organisation dedicated to sustainable development in the globe whereby they partner with charities and raise funds through recognising excellence in leadership across various sectors. An independent brand recognition exercise initiated to give credit and to celebrate brands, teams and marketers who have achieved extraordinary success from innovative and effective marketing practices in South Africa. With the mission to educate and disseminate the importance of branding in South Africa, the awards were not only based on financial valuation but also consumer preference, recognising leaders who have a passion and commitment towards Social Change as well as contributing value by making a difference to their work.